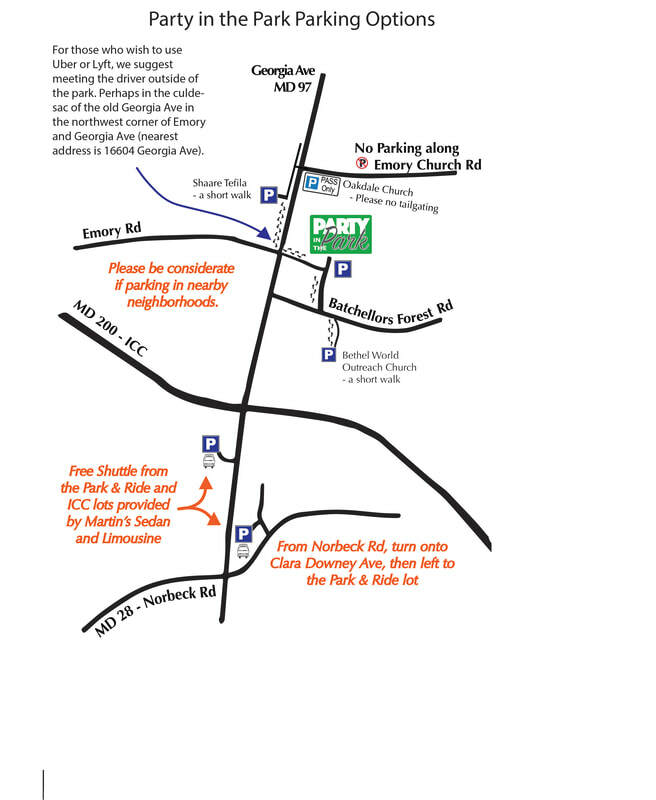 Parking is available in Olney Manor Park, Shaare Tefila right across Georgia Ave (access from the "Old" Georgia Ave), and Bethel World Outreach Church across Batchellors Forest Road. All of these locations are just a short walk to the Party in the Park. If you park in surrounding neighborhoods, please be considerate and be safe - cross Georgia Ave at a crosswalk. Consider carpooling. All the parking at Oakdale Church will be by PARKING PASS ONLY. To get a free Parking Pass, visit one of our participating sponsors and show that you are following them and Olney Civic Fund on Facebook, Instagram, or Twitter. No purchase is necessary. The number of Parking Passes are limited. Be sure to get one now before they run out. Participating sponsors include: Burk & Flinn Orthodontics, Carpet & Vacuum Expo, Chick Fil A, Club Pilates, Fletcher's Service Center, Graeves Tire & Auto, The Karen Rollings Team, Martin's Sedan & Limousine, Orange Theory Fitness. Martin's Sedan and Limousine is providing FREE shuttle service from both the ICC Commuter Lot on Georgia Ave and the Park & Ride at the corner of 97/28 (entrance is from Route 28 - turn onto Clara Downey Ave then left to the Park & Ride lot). If you don't want to search for a parking spot then just head to one of these lots and take the free shuttle.